Discussion in 'Muppet Headlines' started by jgriffee, Feb 25, 2005. No the prefomeces whernt bad but they whernt what we thought they would be it would be like asking for cake getting what you think is a cake but then it ends up tasing like pie still good but not cake. i know that a horribal example but im no my lunch break so whatever. I guess because I didnt expect much it was pretty easy to impress me. I'm still shaken by what I just saw. In The words of Kermit. What the hey? It was appauling to hear whoever was doing Dr. Teeth. Did anybody like this weeks? I've been tuning in since the begining and this week was just awfull. I had to fast foward though most of it, just because of the voices. The only good part was the end when they were trying to get over the balcony. So I'll tune in next week just to see if they have everything under controll if not , not watching it anymore. I'll also be writing to Disney... Can't have this happen. Maybe they're going for the "older" Dr. Teeth? Like someone said to me, Animal seems focused on Dr. Teeth--and Animal is NEVER focused; to which I agree. Animal should be all over the place, man. That's what he does. I'm not so thrown aback by Statler and Waldorf, though I can definitely tell the difference. I like the Statler and Waldorf just fine. Especially at the end. It's a fun spot. It's a fun show. It just isn't what they have been doing all along. But, I still had fun and I'm always glad to see more Muppets! Just...hopefully Dr. Teeth's voice will deepen and get more gruff. Ack, reading this thread has made me extremely antsy. Everyone seems so upset by it. I thought it was just fine. I thought the whole going over the balcony thing was great. Obviously the whole thing was not spot-on, as many people have pointed out little discrepancies, with voices and chemistry and whatnot. But I don't expect it to be perfect every time. No show is perfect every time. Even TMS has a few episodes that I just can't sit through. And many people have said they disliked parts of this show before. So though it wasn't my favourite, I'm not about to attack this one. This is the way it's gonna be. It's either, have these performers now, or not have any episodes (as Steve, Dave, Bill etc. are doing christmas specials and other good things). And since whoever the Powers That Be are want to keep these in the spotlight, it's gonna continue. They wouldn't put it up if it was absolutely awful (that would be worse than none at all). So we just have to sit tight and see how next week will be. Kudos to Victor and Drew. They're great guys and do really good voices. Victor also has a great Fozzie Bear voice, too. If they are temporarily here, good for them. When Steve, Dave, and Bill are finished with their other work on Kermit's 50th, I want to see them back on the Movies.com thing. I just started it today. any help would be helpful. tell me what you think. or if any one whats to write stuff for me. they are welcomed too! It's strange how Jim Henson Hour in 1989 was more edgy and hip than 2005. I agree, I was very unnerved this this week's episode. Yes, I know we should be grateful were getting anything, and its nice to have these new spots. But it's night and day with replacement puppeteers. Man, that Dr Teeth segment was unnerving. That music was dreadful, and the whole skit was just creepy. I'll take Swedish Chef making OJ Simpson daisy duke pants any day. And does this mean no more Baretta Pepe? Noone can come close to the slight nuances and cadences Bareetta pulls off. Ooh, I never thought of that. I think I would end up turning off the video if someone else did Pepe. It would be too weird. I hope somehow they can bring him back. I especially loved when he was on the streets or at that movie premiere, talking to people. Who knows, maybe they recorded more than one and are saving it up. Though that's probably wishful thinking. However, I didn't like the new voice for Dr. Teethliek what you all said. It was nice to see him though and the spirit of Dr. Teeth is the same, but the voice is to darn high. I thought aninal sounded like Animal. From what I understand any guest on it would be performed by the 2 puppeteers including pepe, just like what happened in the pilot. Muppet DK is correct. Any character cameo done for movies.com will be performed by Yerrid or Massey. And Goelz etc are not too busy to shoot. None of the specials are in production yet. Most prob won't happen at all. Wait, why would most not happen? They are announced and everything. Talk is cheap. And the person talking is not at MHC anymore. ABC is lukewarm on Next Muppet idea. Xmas special is not ready for preproduction. The only shows being produced atm are ESPN and movies.com. Yet they are not 'major'. What you say about the xmas special makes a lot of sense. It's way to late to start such a special when you take into account scheduling, filming, editing, marketing, etc. Why do all those people have to lie. Can't they just say "we're thinking about doing some stuff with the muppets, like a christmas production, but it's a ways away" instead of "there's going to be a christmas special with Kermit and friends coming up." Not the best way to tell the auidence because after all, they're going to be watching the shows and decide if the muppets cane make it in todays markets. Another question, what other jobs does Dave, Steve, Bill and others do, besides being parents or grandparents, if they are those. I thought they just performed the muppet characters. I'll take Swedish Chef making OJ Simpson daisy duke pants any day. That was Classic Muppets all over again there, wasn't it?? I LOVED that! Another question, what other jobs does Dave, Steve, Bill and others do? I thought they just performed the muppet characters. 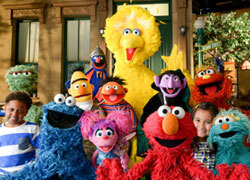 Steve Whitmire, Eric Jacobson, and Kevin Clash are all 3 big players in Sesame Street. They do a lot of stuff for the show (especially Kevin). Steve and Eric do a lot with Bert and Ernie (there is a big B&E special in the works); and Eric also helms Grover (another big Sesame character). Kevin does a lot of stuff for Sesame Street (beside Elmo) he does a lot of producing and executive stuff. The puppeteers have to be in NYC to tape episodes and whatnot from time to time, and have other commitments with the show and the workshop that prevent them from giving 100% of their professional time to the Muppet Holding Company. Bill Barretta does a lot with the Jim Henson Company - writing, producing, and whatnot. He's working on several projects with them right now (as writer/producer/coordinator/puppeteer). Brian Henson also has a ton of Henson Co. stuff to do (he is co-CEO). So they can not dedicate all of their time to everything Disney needs them for. Dave Goelz mainly does the Muppets right now, but he is the oldest member of the principle team (59 years old). Other Muppeteers like Frank Oz and Jerry Nelson have stepped back to do other things and are not really working with the Muppet now. Plus all the puppeteers have lives, families, and they even do other non-Muppet Puppeteering work from time to time for things (such as with the Henson Co.). And with a Fraggle film in the works Steve and Dave (and possibly others) would be needed for that. Not to mention that Disney wants the Muppets in 2 places at once. It's hard to have Kermit travel the world for this Birthday celebration, tape a TV special, have Statler be on Movies.com and ESPN, have some talk show appearances, have Ernie do his Sesame Street work, have Wembley be in a Fraggle film, and let Steve have a life - without having Steve practically live on a plane while hopping all over the place for the next year (not to mention the cost of that for the producers). It's not impossible to keep the original Muppeteers attached to their characters while still having the Muppets become more active in the public eye, but it will take some coordination, planning, and money. But right now it seems like Disney is looking for the easiest and cheapest solution to the problem. Why do all those people have to lie. Can't they just say "we're thinking about doing some stuff with the muppets, like a christmas production, but it's a ways away" instead of "there's going to be a christmas special with Kermit and friends coming up." At the time it was not a lie, when they said the productions were coming they were going to make the productions. But things changed. Although they were going to make a Christmas special for this winter, it is unclear if it will happen (and now it is looking grim if it will happen). Will America’s Next Muppet happen? It’s hard to tell now. The problems really came when there was change in the Muppet Holding Company executives and leaders, when certain people left certain plans changed. Plans change all the time - take a look at the MuppetCental news archives, there are at least a dozen films, TV shows, and productions that never came to be - even after being officially announced. It is always a shame when productions get announced and never come to be, or get delayed, changed, whatnot - but no one lied, unforeseen changes happened. So what is up with Muppets now? What are the “big plans”? What is the next “big thing”? I don’t know. 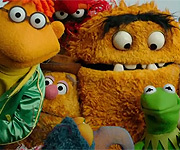 The Muppets Holding Company is working on plans for the franchise, and whatever they come up with will be announced with the decisions are made. Are all the old plans and project dead now? No, not all of them. Are some of them not going to happen? Maybe, probably, who knows? Things are in the works, things are being planned, things are changing, we’ll just have to hang in here and see what happens.